W elcome! Well, this is my next series of Zelda tales. It's set seven years after the previous Battle For Power trilogy, and sets out to answer some of the questions that remained unknown at the end of the last series. This is the third and final book in the Next Saga trilogy (6th in the entire series). I left you with a terrible cliffhanger, no doubt you're all keen to find out what happens! While Ganondorf seems defeated once and for all, his demise unleashes a terrible maleovant power that was waiting in the wings, should their master fail them. These evil spirits have plans - big plans... will the nightmare ever end for Link and Zelda, and the fair Kingdom of Hyrule? Well, if you want to discover the truth, get reading this bumper 100 page edition, which hopefully ends the series with a bang! 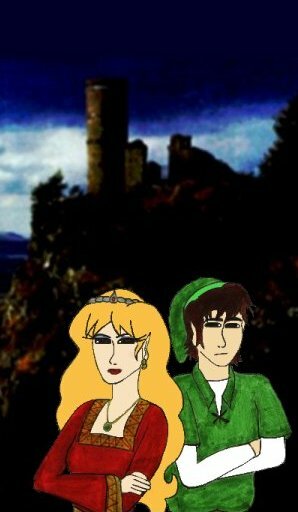 At the end of the last book, we were left hanging over what happened to our hero Link, and his beloved Princess Zelda. Ganondorf struck a mightly blow, killing Link... or did he? A surprising action by a lover from the past helps Link to finally defeat the evil Gerudo wizard, and Leigh seals his spirit up in her special sword. The nightmare is finally over, or is it?